Wigan Athletic missed a chance to secure their Championship play-off place as they suffered a shock home loss to Blackpool at the DW Stadium. The hosts missed a first-half penalty as Martyn Waghorn's powerful spot-kick was blocked by Matt Gilks after Tony McMahon had fouled Shaun Maloney. 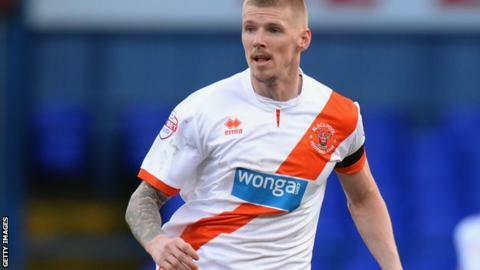 But Andy Keogh's header from Isaiah Osbourne's cross put Blackpool ahead. Blackpool chairman Karl Oyston paid for 3,000 tickets - at a cost of £60,000 - and handed them out for free to season ticket holders for this game, while Blackpool also had a social media campaign running to 'Turn Wigan Tangerine'. About 4,000 away fans turned up at Wigan, with the majority in team colours, wearing tangerine shirts, scarves or hats and waving flags and balloons. Keogh then set up Stephen Dobbie, whose low shot sealed the win to take his side out of the bottom three. It was only Blackpool's third victory in 28 league games and came at a vital time as they had begun the day in the relegation zone, facing a drop to the third tier of English football only three seasons after being in the Premier League. This win, their first away from home since 2 November, does not ensure their safety but leaves them in 18th position and three points above the drop zone with one week of the season left. For Wigan, who drop from fifth to sixth in the table, they will see this as a glorious chance missed in a game they dominated before Blackpool took the lead on 60 minutes. However, the Latics will still secure a play-off place if they win away at Birmingham on Tuesday with Uwe Rosler's side having one game in hand on the sides around them. Despite being backed by a large and vocal away support, the visitors struggled to enforce themselves on the game in the first-half. After James Perch had headed at Gilks and Jordi Gomez had shot wastefully wide from 20 yards, Wigan were awarded a penalty, but Gilks's superb one-handed save, diving to his left, denied Waghorn and kept the scores level. Blackpool failed to test Ali Al-Habsi in the first-half and the visitors only half-chance came when Neal Bishop failed to connect with Chris Basham's dangerous-looking ball into the box. But the home goalkeeper was picking the ball out of his net on the hour mark when Keogh converted from Osbourne's floated cross. Barry Ferguson's side doubled their lead 10 minutes later when the impressive Keogh pulled the ball back and Dobbie steered his shot into the net. Blackpool still need a positive result from their last game of the season, at home against Charlton next Saturday, but their hopes of survival are much stronger now than at the start of the weekend. "When I came in at the beginning of December we weren't in a position to be anywhere near thinking about the play-offs but now with two games to go it is still in our own hands. "If you let the ball bounce as we did for the first goal then you have a problem and that goal was decisive. With the way Blackpool had set up we knew it would be difficult to score any goals as they had everyone behind the ball. "We move on and no-one is panicking. We have two games more to get those three points." "It's a massive win for us. The group has got stronger and stronger and it was a great day for the fans. "It was important that we got a result that would give us a chance for next week and make sure it was still in our own hands. "The penalty save gave us a boost and in the second half we scored two goals and totally dominated. We have spoken in the group about being positive and we are not looking negatively at the season at points we may or may not have picked up. "We went out with a firm belief that we would win the game. We want to try and build something and get ourselves in a position to get further up the league." Match ends, Wigan Athletic 0, Blackpool 2. Second Half ends, Wigan Athletic 0, Blackpool 2. Substitution, Blackpool. Ángel replaces Stephen Dobbie. Attempt missed. James McClean (Wigan Athletic) left footed shot from the left side of the box is just a bit too high. Assisted by Jean Beausejour with a cross. Attempt missed. Nick Powell (Wigan Athletic) header from the centre of the box misses to the right. Assisted by James McClean with a cross. Attempt missed. Tom Barkhuizen (Blackpool) right footed shot from outside the box misses to the right. Assisted by Harrison McGahey. Corner, Blackpool. Conceded by Leon Barnett. Attempt blocked. Ricardo Fuller (Blackpool) left footed shot from the left side of the box is blocked. Assisted by Craig Cathcart. Corner, Wigan Athletic. Conceded by David Perkins. Substitution, Wigan Athletic. James McClean replaces Shaun Maloney because of an injury. Offside, Wigan Athletic. Ali Al-Habsi tries a through ball, but Marc-Antoine Fortuné is caught offside. Delay in match Shaun Maloney (Wigan Athletic) because of an injury. Attempt missed. Nick Powell (Wigan Athletic) left footed shot from outside the box is too high. Attempt blocked. Jordi Gómez (Wigan Athletic) left footed shot from the right side of the box is blocked. Assisted by Callum McManaman. Offside, Blackpool. David Perkins tries a through ball, but Tom Barkhuizen is caught offside. Offside, Blackpool. Chris Basham tries a through ball, but Andrew Keogh is caught offside. Goal! Wigan Athletic 0, Blackpool 2. Stephen Dobbie (Blackpool) right footed shot from the centre of the box to the bottom left corner. Assisted by Andrew Keogh with a cross. Substitution, Wigan Athletic. Marc-Antoine Fortuné replaces Roger Espinoza. Substitution, Blackpool. Tom Barkhuizen replaces Neal Bishop. Attempt missed. Shaun Maloney (Wigan Athletic) right footed shot from outside the box is just a bit too high from a direct free kick. Corner, Wigan Athletic. Conceded by Anthony McMahon. Shaun Maloney (Wigan Athletic) wins a free kick on the left wing. Foul by Chris Basham (Blackpool). Goal! Wigan Athletic 0, Blackpool 1. Andrew Keogh (Blackpool) header from the centre of the box to the bottom left corner. Assisted by Isaiah Osbourne with a cross. Foul by Stephen Dobbie (Blackpool). Attempt missed. Isaiah Osbourne (Blackpool) header from the centre of the box misses to the right. Assisted by Anthony McMahon with a cross following a corner. Corner, Blackpool. Conceded by James McArthur.